Today is Holy Saturday. I find today one of the most uncomfortable or awkward days in terms of feasts and commemorations of the Church. From Palm Sunday to Good Friday, we know what we’re about. The Triumphal Entry. Christ clearing the Temple. Christ on the Mount of Olives and disputing with opponents in the Temple. There’s nothing mentioned in Scripture for Wednesday — so we do Tenebrae to make up for it. Then comes the Last Supper and the Betrayal. And, of course, Good Friday. After Good Friday, Easter Sunday — Resurrection, glory. Loosening our throats and tongues to shout, ‘Allelu–‘ you know the rest, ja? Today the Disciples (soon to be Apostles, if they only knew!) are in hiding. The women — His Mother, Mary Magdalene, Salome, et aliae — are mourning His death. 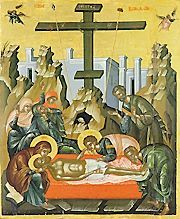 On Holy Saturday, God’s body is lying dead in a tomb. All there is to do is wait. We aren’t good at that in our culture. I’m not that good at it, myself. I’d like Easter Sunday now, thank you very much. But I think this awkwardness, this discomfort, this twitching while we wait is good. It will make tomorrow morning, bleary-eyed but excited at 5:30 AM, that much more exciting. The tension of today increases the release of tomorrow as we all respond to, ‘Christ is–‘ well, you know. But not yet. For now, waiting. The Body of Our Lord in the Tomb. I shared this reflection with my fellow students today at lunch time, joined with prayers from my translation of ‘The Office in Honour of the Holy Cross‘ out of Aelfwine’s Prayerbook. The inspiration is the text of 1 Corinthians 1:18-31. Here we are on the third day of this week, headed inexorably towards Friday. From palms and rejoicing to death and sorrowing. Friday’s long shadow, the shadow of the cross, covers this week for us, even though we know that Sunday and the rising of Christ will come. But before we stand in awe of the risen Jesus like the mosaic in the apsidal dome of Basilique Sacré-Coeur on Montmartre, in Paris, we must pass through Friday, where we come face to face with the wisdom of God, with Fra Angelico’s fresco of Saint Dominic adoring the cross in the monastery San Marco in Florence. This is the wisdom of God—a darkened sky and a bleeding, dying saviour. This automatically looks like folly to the wise of the world. And let us not fool ourselves here. We are the wise of the world, are we not? We are getting or already have university educations, learning the skills of critical thinking and logic. Some of us are so ‘wise’ we are getting PhDs — the height of worldly wisdom! We are accumulating knowledge and parsing ideas and texts and persons and characters. The whole university project, including New College, is founded upon the importance of reason. So let us not scoff so quickly at the worldly-wise fools who have not accepted Christ, those silly atheists, agnostics, Hindus, Muslims. For we, too, are worldly-wise. We, too, like it or not, are so very often fools. Think upon this — and I do not mean to scorn the theologian’s trade in what follows; a Classicist and historian by trade, I am nonetheless an amateur in the field of theology — we spend hours and years and pounds of paper and litres of ink to talk about this glorious, wondrous event that occurred on Good Friday all those years ago. What we do, what we have been doing for centuries, amidst the glory and the wonder is, at times, parse the mystery. How does the death of Christ save us from our sins? Why does the death of Christ save us from our sins? What exactly must we do to profit from this death? Not unimportant questions. But not always to the point. For here is the wisdom of God, the logic of salvation: The immortal dies. The mortal benefits from this death and gains immortality by trusting the immortal who died. There is no logic here. This is divine wisdom. It is myth enacted on the stage of human history. I like reading the books of theology and the books of the mystics and the beauty of liturgies. Sometimes, however, we think we can pierce the mystery of the cross and what transpired there. Sometimes we think we can figure out, to the most precise degree of logic and computation using the tools of history, philosophy, and philology, how it is that God became a man and died for our sins. But however close we come, we fall short. We cannot fully penetrate this mystery, for it is the divine economy for our salvation. It is the power of God to save the entire human race through his own death and resurrection. Try as we may, the Cross will forever be a stumbling-block. To ourselves. To our friends. To ‘Greeks’. To ‘Jews’. Therefore, without ceasing our rational questionings altogether, there are times when we must put the books down. Put our pens and paper down. Close our laptops. Stop parsing mystery and revel in it. Become wise fools for God. And so let us turn aside from those equipped with wealth who take pride in rhetorical skill and join with the humble fishermen of Galilee who had trouble perceiving the meaning behind the miracles and parables of our Lord. Let us take up this stumbling-block, this foolishness, this wisdom of God, and wonder at it. Let us become wise fools. I have a few ideas to help cure us of our worldly wisdom, to help us enter into the mystery of the wisdom of God as wrapped up and displayed for us in gory glory on the Cross. As an historian and Classicist, they tend to take us back in time to our forebears in the faith. For those so inclined, fear not art. A painting of the crucifixion will have trouble presenting to us Our Lord and Saviour’s majesty—but therein is the glory. The glory of God is found precisely in his weakness, in his willingness to suffer and die as one of us for all of us. A fifth-century theological motto was, ‘One of the Holy Trinity suffered and died for us.’ And he suffered fully God and fully human. 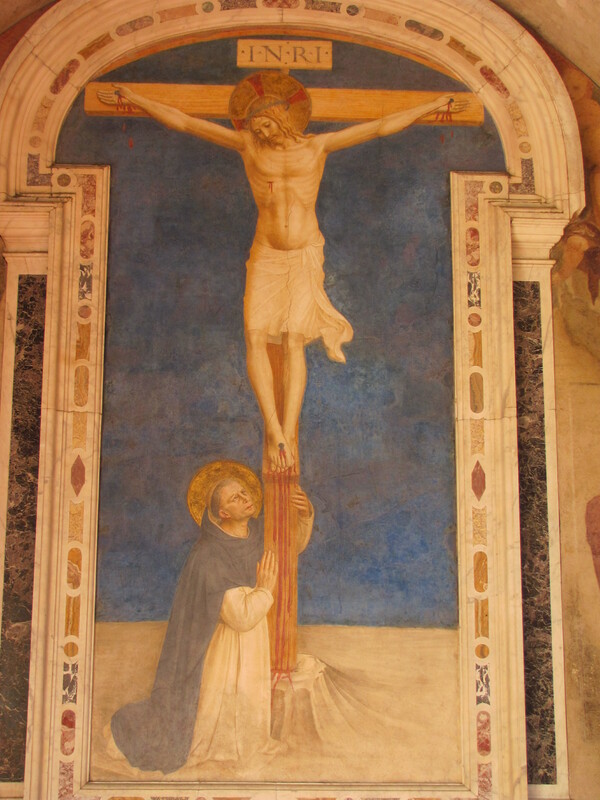 In San Marco, Florence, Fra Angelico painted frescoes of the crucifixion in each of the cells for the novices. Before each crucifix was the image of St Dominic in a different posture of prayer. In the National Gallery of Canada, in Ottawa, there is a Renaissance painting of Christ with the crown of thorns. This was probably one of the first bits of Renaissance art I’d ever seen. And it moved me almost to tears—the exquisite skill of the artist made the thorns look like real thorns in real flesh, the red paint like wet drops of real blood. Here was Christ who saved me. In the Art Gallery of Ontario, in Toronto, is a large, exquisite bronze crucifix by Bernini. Just Christ’s body, suspended in the air of the gallery, hanging, dying, his flesh and bones and agony and sorrow on display for all—one of the Holy Trinity was crucified for us. These images were made to drive us to prayer, to remind us of the real cross of history. Prayer is the gateway to this mystery. Why not pray before an icon or painting? Doing so, you may just become a wise fool. How else can we become wise fools? Through the world of music. Try Bach’s St Matthew Passion or St John Passion. Listen to Part 2 of Handel’s Messiah. Enter into the world of mediaeval mystic St Hildegard von Bingen through her music as well. It is beautiful and enchanting. Or perhaps the Renaissance is more your style — there is always Thomas Tallis and Alessandro Striggio, whose settings for the Eucharist — that perpetual memorial of Christ’s precious death and glorious Resurrection—can stir the soul to worship of Almighty God in potent ways. There are ways music can lift our souls that reason and logic cannot. Embrace them to enter into the mystery of Christ crucified. Find the wisdom of God in music. Become a wise fool. Perhaps St Thomas à Kempis’ Imitation of Christ is more your style. Or maybe you’re more Reformed, and these mediaeval people are a bit unsettling. Become a wise fool through John Calvin’s Golden Booklet of the True Christian Life — found in the 21st chapter of the Institutes. Find your way beyond simple logic-chopping into mystery. Become a wise fool. Read and reread the Gospel narratives of Our Lord’s passion. Enter into the story. Join Mary, Mary Magdalene, and John at the foot of the cross. Through the cross we enter into paradise, into the embrace of the Holy Trinity — of a God whose very nature defies worldly wisdom and straightforward logic. Become a wise fool. God has chosen the foolish things of the world to put to shame the wise, and God has chosen the weak things of the world to put to shame the things which are mighty; and the base things of the world and the things which are despised God has chosen, and the things which are not, to bring to nothing the things that are, that no flesh should glory in His presence. Grasp this foolish God, grasp this God who conquers through defeat, who is exalted in lowliness, who dies to bring life, who lived with us to die, who is one yet three. Grasp this foolish God who brings heaven and life and paradise and wonder as close as our very breath. Who is Himself as close as our very breath. He became a human that we humans might become like him — and he wrought this great deed through the foolishness of this stumbling-block that is the Cross.